"WOW! This is Yellowstone, why have I lived here 6 years and never visited before?" "I could not imagine a better visit to the park." "I see why you love this place, and how it could never get old." Those are just some of the things said by students after this great little two day trip to paradise, the granddaddy of all national parks: Yellowstone National Park. We left Billings, Mont. and the campus of Rocky Mountain College a little before 5:30 a.m. Saturday, Oct. 9. Due to nearly nine inches of snowfall on the Beartooth Pass the evening before we had to take the "long" drive to the Park's north entrance in Gardiner via I-90 and Livingston. Arriving at the park to a very cloudy 8:00 a.m. start we got to work on the point of the trip, taking photographs. We headed south all the way out to West Yellowstone for lunch with only a few photo stops along the way (Nice light on Swan Lake, Bison, Chocolate springs, Elk, etc.). After a quick lunch we were headed back in and south to Castle Geyser, but progress was slow with stops to shoot a Bald Eagle, Trumpeter Swan, Great Blue Heron, more Elk, and autumn vistas. This was our second consecutive class trip. We arrived to Castle Geyser blasting off and then spent some time spent shooting around the area. At this point we needed to head back toward Gardiner as the general consensus was that we wanted to spend some time in the boiling river, but the park had better plans for us. As we drove north we had the pleasure of sighting a Grizzly relatively near the road and were able to photograph it for some time before it crossed the Gibbons River and headed up the opposite hillside. At this point the students were more than OK with not making it to the boiling river, and their "great" trip had begun. The day finished off with a sunset shoot atop the upper terraces, then off to the Super 8 to get checked in, then K-Bar for some great pizza and conversation. I was the "bad guy" who ordered 5:15 a.m. wake-up calls for every room so we could have breakfast at 6:00 a.m. and be on the road at 6:25 a.m. With Moose and Black Bears on the top of my students list we were off for the drive to Petrified Tree, with no luck on Moose nor great color at sunrise. I was starting to think that the Grizzly was going to be our "great encounter" for the trip. We drove through to the Bison Ranch for some colorful cottonwoods with the meandering streams and a few Bison. A carcass from the previous day occupied many watchers, but there was no wildlife activity yet, so we headed over to Slough Creek to see what we could find. There was a nice heard of Bison along the creek. From there it was over the Dunraven Pass with stops for Bighorn Sheep and the decision not to spend time with the Tower Store Black Bear. We drove over the pass, through the clouds, with stops for only a few landscapes. We hit the canyon and a quick check for Great Grey Owls, still driving south. We heard reports of a Grizzly Sow with cubs and were still hopeful that we might have something else exciting, but none of us were expecting what came next. “Stop, grab the pullout,” was my radio call, at Otter Creek. There were a few people stopped and looking down... my excitement grew. "Yes, I can give them some Otter shooting" was racing through my mind, but the Park had an even bigger treat for all of us. The Canyon Pack Grey was bedded down some 40 yards from the road, and Park staff was allowing folks to photograph from the road’s edge. The students scored something that few get to experience, a relaxed wolf very near the road. I had no idea what was about to happen next. After about 45 minutes of photographing every head lift the students were about ready to go, but we stayed just long enough for the Wolf to get up and make his way towards the two nearby Bison, a bull and a cow. The bull’s attempts to breed the cow met with a collapse from her. It became obvious that the cow was injured and weakened and that the Wolf had special plans for her. 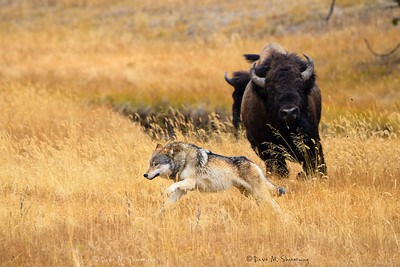 The Wolf began to approach the Bison pretending to have little interest in them, but then would charge and a nip, to be met with a kick and the need for retreat as the bull was in violent pursuit of the lone Wolf. All present were snapping away as the Wolf eluded the bull on each of its charges. After a few rounds of this the Bull appeared to give up defending the cow and the cow was left to defend herself, which for the next hour she successfully did. At this point the action was about 100 yards away and most of my students were ready to go as their lenses, even those borrowing my 70-200s with TCs and my 400, just didn’t have the power to capture shots, as they would like. We waited for a chance to get our blocked-out vehicles out of the pullout and then we were off toward Mud Volcano, a quick bathroom break and snack stop. Then we drove north over Dunraven toward home. We made a few scenic stops, then a stop to shoot a beautifully perched Bald Eagle near the road, which led to another Eagle approaching, and a quick grappling display. Then we were off again. Down to Tower where we decided to pass by the "boring" distant Black Bear, then off to Mammoth with only a stop around Phantom Lake to photograph a mousing Coyote. After that we were in homeward bound mode and only stopped for gas and dinner as we made our way back to Rocky Mountain College. I love my job and absolutely love being in a position to take art students down to Yellowstone each semester. I am able to take students from India, Sweden, Florida, Washington and everywhere in between to the world’s first and, in my opinion, best national park for an experience they will never forget. Once in a while we have experiences that few ever get the privilege of having and this trip was one of those very special trips where the Park provided an experience beyond the students’ wildest dreams. Before leaving for the Park, one student had Wolves on the mind. I kept telling her that with only 75 Wolves in the park I could not promise her anything, but that we would try our best to at least see a Wolf, even if it was only through binoculars. If you could have seen the smile on her face when the beautiful Grey Wolf stood up and looked around, you would appreciate why I love taking students to our "local" paradise. Most of my photographs are actually of students photographing cool things, but I had to take a few for myself, too. If you have questions, ask. I published all of the camera information with each image and have added full keywords to share just about anything you would want to know about each of the images. P.S. If, like one of my students you have been in Montana for years and have never been to the Park, first shame on you. Second, plan a trip ASAP. You will not regret it. If you have questions or need help planning there are tons of resources and I am always willing to answer questions via email. I am finishing off my 4th year for making at least one Yellowstone trip a month, every month of the year, and am more than willing to share information about the park. lol. i am already planning for my 2nd trip to YNP. i am sure that i will never forget my 1st trip and those beautiful pics i took with ur help. TY for these beautiful memories. fyi: it was scary to see that big bear stand up on his/her 2 legs. thats was priceless. Wow! We were just in YNP in late September and got to see some wolves too. I didn't get any shots quite like that though! Keep up the good work! "Everyone should go to Yellowstone at least once in their life!" Last month we spent 10 days in Banff and Jasper up in Alberta, Canada and got some amazing elk shots! They were actually the best we've ever gotten! I will definitely come back and enjoy your photos! I was there to witness this with my husband and my daughter from Peru. I love photography but I don't have a good camera, so I had been searching for the photos in the webb and finally I found the LA Times and thanks to your comments and your link there I got to see here "the photos", great job!!!... Thanks for sharing, now my friends and family will be able to se them!! !